In August 1978, Bill Parker of Pine Bluff found a small stone figurine during construction at a paper mill near that city. Mr. Parker brought the artifact to then UAPB Station Archeologist, Leslie C. Stewart Abernathy. Stewart-Abernathy visited the location to observe the context of the find and to make a collection that included 52 lithic flakes, 89 percent novaculite by weight, and 1 small grog-tempered pottery sherd. Mr. Parker generously donated the figurine to the Arkansas Archeological Survey. The find location is on the edge of the West Gulf Coastal Plain uplands (sometimes referred to as “the piney woods”), overlooking a small bayou where it leaves the uplands and enters the Arkansas River floodplain. 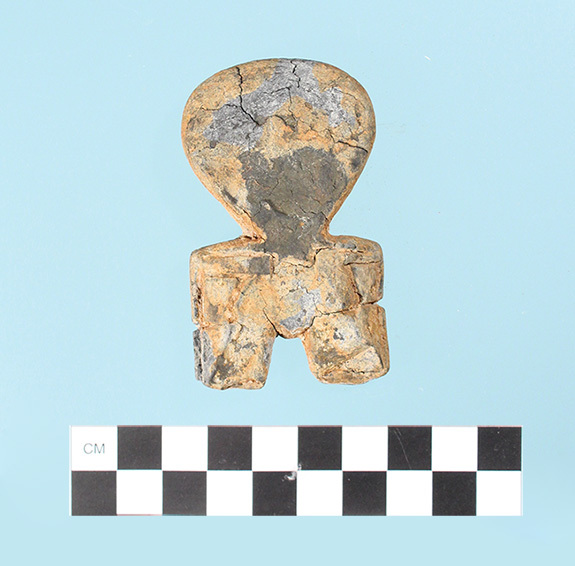 This small stone figurine found near Pine Bluff, Arkansas may be associated with the Poverty Point Culture. The Parker figurine is 72mm in length with a maximum width of 42mm and average thickness of about 11mm. It has a rectangular cross section. The object is made of a dark grey shale or slate with a reddish-brown patina on its surface from weathering. We initially conjectured that the artifact was associated with the Poverty Point culture. The Poverty Point culture flourished in portions of the Lower Mississippi Valley and adjacent Gulf Coast between about 2000 and 700 BC and is characterized by large-scale mound building, long distance exchange in raw materials, and distinctive artifacts such as fired clay balls and rare ceramic human figurines. The low frequency of pottery at the find location and the preponderance of novaculite in the chipped stone materials are consistent with Poverty Point and contemporary cultures. The Poverty Point site, near Epps, Louisiana, was by far the largest Archaic period ceremonial center constructed in the Southeast. According to archeologist Jon Gibson, a vast trade network emanating from Poverty Point drew the participation of dozens of communities in the central and lower Mississippi Valley. Several contemporaneous communities located in southeast Arkansas and in the southern Ouachita Mountains participated in the Poverty Point cultural sphere. This trade generated a widespread distribution of artifacts made from a variety of imported materials, including shell, copper, and varieties of stone brought from considerable distances. These materials were used to make carved beads and figurines depicting humans, insects, animals, and birds. These objects represent an expansion in the use of artworks to symbolize relationships between human and nonhuman beings. In 1982, replying to a letter from then Toltec Station Archeologist Martha Rolingson, Dr. Clarence Webb (1902–1999) supported a Poverty Point association for the Parker figurine. Dr. Webb cited illustrations from his 1977 Geoscience and Man monograph on Poverty Point culture, pointing to distinctive features shared by the Jefferson County figurine and artifacts from Poverty Point culture contexts. These include rectangular eyes and mouths occurring on baked clay figurine fragments from the Poverty Point site in Louisiana and the pattern of incising on a tablet made of jasper, a silicate rock similar to chert, from Jaketown, a prominent Poverty Point culture site in Mississippi. Webb, a medical doctor from Shreveport, conducted and published research at prehistoric sites in Louisiana and neighboring states for over five decades. 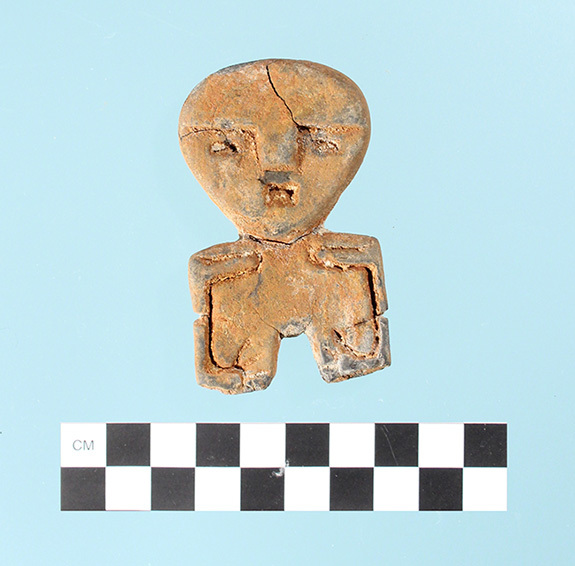 The figurine, now in the research collections of the ARAS-UAPB station, remains intact 40 years after its discovery, though it has developed cracks and in places exhibits a residue that may be from salt or other soluble minerals that have made their way to the surface of the piece as it dried. 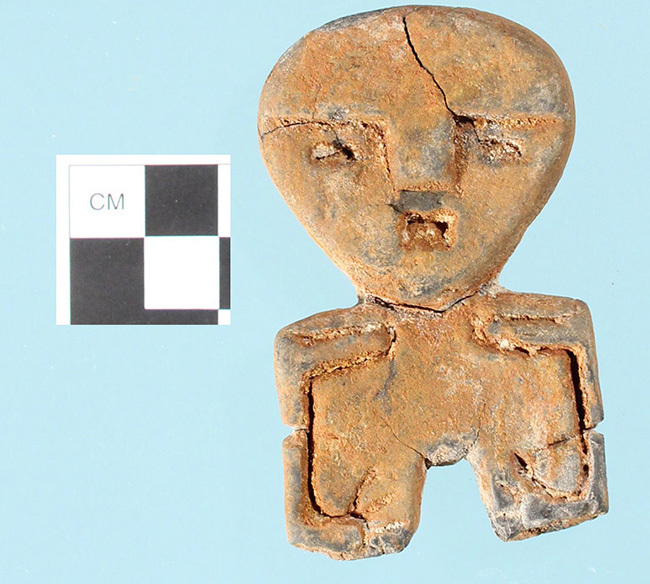 Found by Bill Parker of Pine Bluff in 1978, this figurine is 72mm in length with a maximum width of 42mm and average thickness of about 11mm. It has a rectangular cross section. The reverse side of the Parker figurine. The object is made of a dark grey shale or slate with a reddish-brown patina on its surface from weathering.